8-bit bi-directional ports (3 ports on each connector). The 8-bit ports on each connector are port A (PA), port B (PB), and port (PC). Each 8-bit port can be independently set as input or output. All ports are configured as inputs upon power-up or reset. The OME-PIO-D144 has one D-Sub connector and five 50-pin flat cable connectors. Each header can connect to a 50-pin flat cable. The flat cable can be connected to OME-ADP-37/PCI or OME-ADP- 50/PCI adapter which can be fixed on the computer chassis. 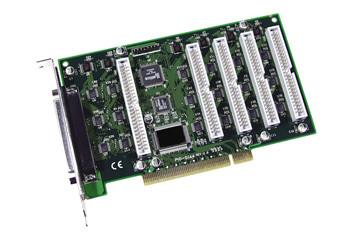 It can be installed in a 5 V PCI bus and supports true "Plug & Play". All boards are supplied with a standard software development kit for Windows XP/Vista/7. The software development kit includes dll files for programming in C,C++ or other high level languages and OCX files for Visual Basic or Active X programming.LabView drivers are also included. 참고: OMEGACARE extended warranty program is available for models shown on this page. Ask your sales representative for full details when placing an order. OMEGACARE covers parts, labor and equivalent loaners. All boards include utility software and a complete user's manual on CD-ROM.